Memories, Dream, Reflection by Carl Jung and Anne Jaffe took me a good portion of the summer to read from cover to cover. This auto/biography has provided a great deal of meaning and symbolic significance to my personal perspective. I interacted with the text, reading and writing with a pen and highlighter handy; below are a few of many sentences extracted from the book that speak volumes in the space of a few sentences. Life has always seemed to me like a plant that lives on its rhizome. Its true life is invisible, hidden in the rhizome. The part that appears above ground lasts only a single summer. Then it withers away an ephemeral apparition. When we think of the unending growth and decay of life and civilizations, we cannot escape the impression of absolute nullity. Yet I have never lost a sense of something that lives and endures underneath the eternal flux. What we see is the blossom, which passes. The rhizome remains. When people say I am wise, or a sage, I cannot accept it. A man once dipped a hateful of water from a stream. What did that amount to? I am not that stream. I am at the stream, but I do nothing. Other people are at the same stream, but most of them find they have to do something with it. I do nothing. I never think that I am the one who must see to it that cherries grow on stalks. I stand and behold, admiring what nature can do. There is a fine old story about a student who came to a rabbi and said, “In the olden days there were men who saw the face of God. Why don’t they any more?” The rabbi replied, “Because nowadays no one can stoop so low”. One must stoop a little in order to fetch water from the stream. The following excerpt from Alan Schneider’s book Doors in Disguise builds on his discussion of the Creation Diagram. This diagram, shown on the left of the page, includes the seven major chakras and the triad, diad, and monad. In this excerpt, he relates this diagram with conscious existence. 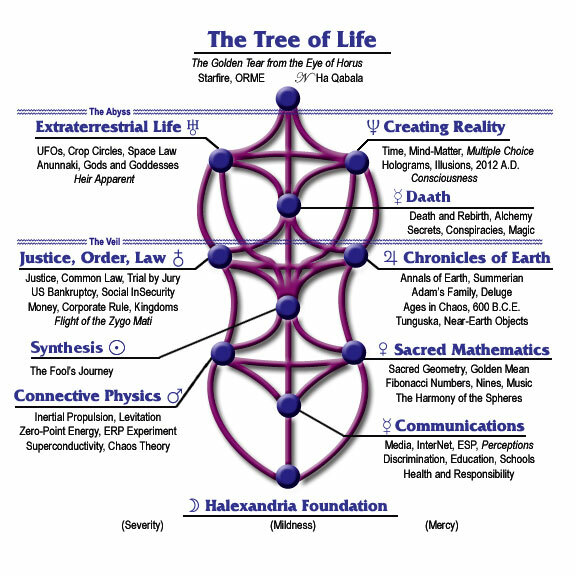 One of the interesting characteristics which can be noted about the symbols on the Creation Diagram is the fact that they all display what the biological sciences refer to as radial symmetry, that is, they all are uniformly constructed around a central point. And the symbols of the Diagram can be said to be harmonically balanced around a common axis. In theory, a radially symmetrical element can be rotated around the central symmetrical axis up to the rate at which the material of which it is composed can no longer remain intact against the resultant centrifugal forces as these increase with that rate. At this point of transition, the element fragments, usually by exploding apart. The symbols of the Creation Diagram are ideal forms and therefore are not subject to physical destruction. Their “rate of rotation” is shown as “zero” in order to clearly reveal their esoteric form to the Seeker. But in the manifest condition of dense form in the physical plane of expression, all of the symbols are always acting in rotation. This movement is the vibration of consciousness which we experience as the world. Consciousness can be characterized as an interactive vibration of complex physical, spiritual, and mental forms. This is directly related to the combined rates and direction of rotation of the Creation Symbols. When we observe any phenomenon, whether simple or complex, we are always “registering” a global recognition of that phenomenon’s composite vibration, which is composed of the interaction of all the rates and directions of rotation of all of the Creation Symbols which are active in the phenomenon’s consciousness expression. We may or may not be aware of this perception, but it is nonetheless occurring, and the Seeker can make great progress by focusing on the world of events in this way. Additionally, I feel constrained to mention here again that everything is a form of consciousness originating in the Tetragrammaton, even a common pebble, a speck of dust, or an atom. When all is said and done, the final Synthesis for this particular universe in general (and for this website in particular) is one of love. Diagram by Brad Reynolds, from Ken Wilber, A Brief History of Everything, (Shambhala: Boston), 1996. “The marvels of the terrestrial plane are being unveiled at an astonishing rate by the physical sciences. The intermediate realm adds life and consciousness: biology helps to understand the former, and for light on the latter we turn to the durable findings of phenomenology, depth psychology, and parapsychology, as well as aspects of shamanism and folk religion. The theologies of the great traditions describe God’s knowable nature (the celestial plane) from a variety of cultural angles, and the literature of mysticism carries the mind as far as it can journey into God’s absolute and infinite depths” [ Beyond the Post-Modern Mind, p.45]. In this all-embracing gradational metaphysic, we have a way of looking at the world totally different to the conventional Materialistic or Dualistic stance. Borrowing a popular Theosophical term, I use the word “Esoteric” to indicate this alternative way of perceiving things. Multiple Exposure of Besheret (BeMused graphic design with LiveBrush and Picasa)and Heads by Pavel Filonov. Together, Space, Soul, Universal Flowering. 0 Egg of the water, source of the earth, product of the Eight, great in heaven and great, in the underworld, dweller in the thicket, chief of the Isle of the Lake of the Two Knives, I came forth with thee from the water; I came forth with thee from thy rest. It was made against those of your retinue, on account of the wish of the spirits that are there, for not letting the breaths be inhaled except by the Great and August God who is in his egg. I come to thee and I am at thy service. Hail, thou god Tem, grant unto me the sweet breath which dwelleth in thy nostrils. I am the Egg which is in the Great Cackler, and I watch and guard that mighty thing which hath come into being, wherewith the god Seb hath opened the earth. Khnum, a god of creation, whose name signifies “The Moulder,” formed the world egg, as though from a lump of clay on his potter’s wheel. In ancient drawings we also find Ptah of Memphis seated on his throne. The Chandogya Upanishad describes the original act of creation as the breaking of an egg in two pieces : The Sun is Brahma-this is the teaching. A further explanation thereof (is as follows). In the beginning this world was merely non-being. It was existent. It developed. It turned into an egg. It lay for the period of a year. It was split asunder. One of the two egg-shell parts became silver, one gold. That which was of silver is this earth. That which was of gold is the sky . . . Now what was born therefrom is yonder sun. When it was born shouts and hurrahs; all beings and all desires rose up toward it . . . He who, knowing it thus, reverences the sun ashrahma. Each in his place, the god divides the creatures. These lines refer to the sun. The Rig Veda describes eight sky divinities. One of these, the Aditya Surya, was born from an egg: Eight sons there are of Aditi, Who from her body were produced. With seven she approached the gods. But the egg-born she cast away. Surya driving his chariot, drawn by red horses, across the sky each day represents the sun god, like Apollo in the Greek pantheon. He, having willed to produce various beings from his own divine substance, first with a thought created the waters, and placed in them a productive seed. The seed became an egg bright as gold, blazing like the luminary with a thousand beams; and in that egg he was born himself in the form of Brahma, the great forefather of all spirits . . . In that egg the great power sat inactive a whole year of the Creator, at the close of which, by his thought alone, he caused the egg to divide itself. 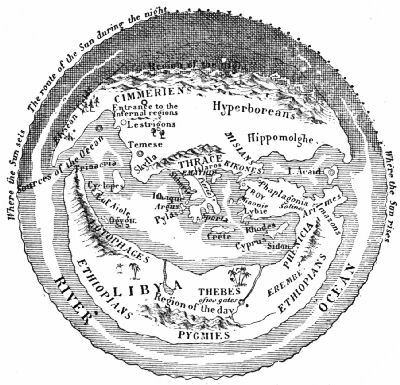 And from its two divisions he framed the heaven above and the earth beneath. In the midst he placed the subtil ether, the eight regions, and the permanent receptacle of waters. Like a whirlwind, refulgent and sparkling. So You Think You Know Language? The oldest words in the English language are around 14,000 years old, originating in a pre-Indo-European language group called Nostratic (“our language”) by experts. Words from this language group that survive in modern English include apple (apal), bad (bad), gold (gol), and tin (tin). The word arctic is derived from the ancient Greek word for bear, arktos. The reason is that the constellation of Ursa Major, the Great Bear, lies in the northern sky. In Old English, the word with meant “against”. This meaning is still preserved in phrases such as “to fight with”. No English words rhyme fully with orange, silver, or month (there are, however, some partial rhymes, or pararhymes, for these words, such as salver for silver and lozenge for orange). The longest English word that contains neither A, E, I, O, nor U is rhythms. The word boycott comes from Charles C. Boycott. He was hired by an Irish earl to collect high rents from tenant farmers who completely ignored him. The word “mile” comes from the Roman milia, “thousands”. The Romans measured distances in paces, which were about five feet. So, milia passum, 1,000 paces or about 5,000 feet, was the length of a mile. Part of a Roman soldier’s pay was called salarium argentium, “salt money”, which was used to buy the then-precious commodity, and so pay today is called a “salary”. The word typewriter is one of the longest that can be typed using only the top row of a standard QWERTY keyboard. Others are perpetuity, proprietor, and repertoire and, if you include obscure words, the longest isrupturewort. The longest word that can be typed using only the home row is alfalfas. No words can be typed using only the bottom row, because that row contains no vowels. The longest words that can be typed on a standard QWERTY keyboard using only the left hand are twelve letters long. There are six such words: aftereffects, desegregated, desegregates, reverberated, reverberates, and stewardesses. The verb “cleave” has two opposite meanings. It can mean to adhere or to separate. The words “beef” and “cow” come from the same Indo-European root. Prior to 1974, a billion in the United States of America was different from a billion in Great Britain. An American or short scale billion was a thousand million (1,000,000,000), but a British or long scale billion was a million million (1,000,000,000,000). The word “kindergarten” comes from the German for “children’s garden”. Friedrich Froebel, who coined the term, originally was planning to use the term “Kleinkinderbeschäftigungsanstalt” instead. The word “tragedy” is derived from two Greek words meaning “goat song”. The word “abracadabra” originated in Roman times as part of a prayer to the god Abraxas. 1640s, from L. aeon, from Gk. aion “age, vital force, lifetime,” from PIE base *aiw- “vital force, life, long life, eternity” (cf. Skt. ayu “life,” Avestan ayu “age,” L. aevum “space of time, eternity,” Goth. aiws “age, eternity,” O.N. ævi “lifetime,” Ger. ewig “everlasting,” O.E. a “ever, always”). O.E. earhring, from ear + hring (see ring (n.)). Now including any sort of ornament in the ear; the pendants were originally ear-drops (1720). 1672, “watery animal fluid,” from L. serum “watery fluid, whey,” from PIE base *ser-/*sor- “to run, flow” (cf. Gk.oros “whey;” Skt. sarah “flowing,” sarit “brook, river”). First applied 1893 to blood serum used in medical treatments. Albert Einstein’s last words will never be known. He spoke them in German, a language that the attending nurse didn’t speak and so couldn’t recall what was said. Only 1% of the population has a “genius” IQ, one of 140 or higher. Up to half of all North Americans with a genius IQ (140 or higher) never graduate high school. CONTEXT: Chief Seattle was one of the last spokesmen of the Paleolithic moral order. In about 1852, the Untid States Government inquired about buying the tribal lands for the arriving people of the United States, and Chief Seattle wrote a marvelous letter in reply. “We know the sap which courses through the trees as we know the blood that courses through our veins. We are a part of the earth and it is a part of us. The perfumed flowers are our sisters. The bear, the deer, the great eagle, these are our brothers. The rocky creast, the juices in the meadows, the body heat of the pony, and man, all belong to the same family. “The shining waters that moves in the streams and rivers is not just water, but the blood of our ancestors. If we sell our land, you must remember that it is sacred. Each ghostly reflection in the clear waters of the lakes tells of events and memories in the life of my people. The water’s murmur is the voice of my father’s father. “The rivers are our brothers. They quinch our thirst. They carry our canoes and feed our children. So you must give to the rivers the kindness you would give any brother. “If we sell our land, remember the air is precious to us, that the air shares its spirit with all life it supports. The wind that gave our grandfather his first breath also receives his last sight. The wind also gives our children the spirit of life. So if we sell you our land, you must keep it apart and sacred, as a place where man can go to taste the wind that is sweetened by the meadow flowers. “This we know: the earth does not belong to man, man belongs to the earth. All things are connected like the blood that unites us all. Man did not weave the web of life, he is merely a strand in it. Whatever he does to the web, he does to himself. “One thing we know: our god is also your god. The earth is precious to him and to harm the earth is to heap comtempt on its creator. “When the last Red Man has vanished with his wilderness and his memory is only a shadow of a cloud moving across the prairie, will these shores and forests still be here? Will there be any of the spirit of my people left? “We love this earth as a newborn loves its mother’s heartbeat. So, if we sell you our land, love it as we have loved it. Care for it as we have cared for it. Hold in your mind the memory of the land as it is when you received it. Preserve the land for all children and love it, as God loves us all. Focus in and zoom out on the reconstructed image of the shield with flash animated precision. This is not an advertisement. Oh no. This is the tone of zealous and enthusiastic expression: Achilles Shield.